ROME (CNS) — On the eve of Palm Sunday, Pope Francis gave young people several missions: to ask their grandparents what their dreams were; to work to make those dreams reality; and to let their bishops and the pope himself know what they need from the church. 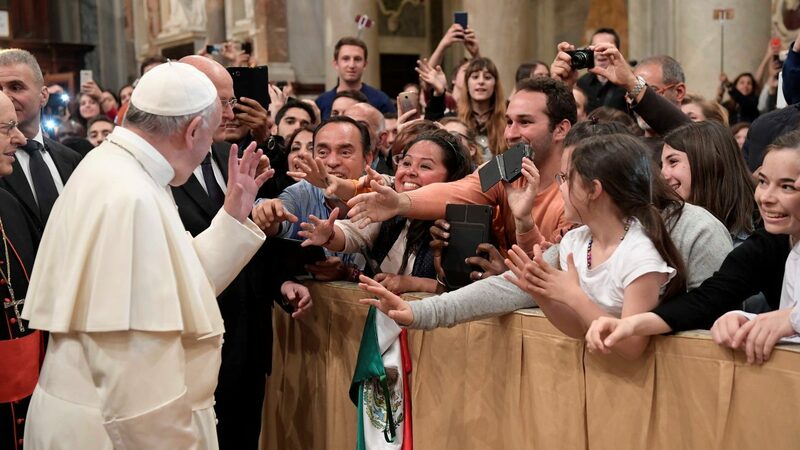 Officially launching the youths’ preparation for the 2018 Synod of Bishops and for World Youth Day 2019 in Panama, Pope Francis gathered with youths and young adults for an evening prayer vigil April 8 at Rome’s Basilica of St. Mary Major. Pope Francis arrived at the basilica with a prepared text, but as a Franciscan sister and a young man who survived a terrible accident shared their stories, the pope took notes, eventually setting aside the text. The church could hold a synod involving Catholic youths active in parish life or Catholic organizations and lay movements. But Pope Francis said that is not what the church or young people need. Young people must harness their energy and ideals and set out, “one alongside another, but looking to the future,” he said. “The world today needs young people who go in haste,” like Mary went to her pregnant cousin Elizabeth. Franciscan Sister Marialisa, 30, who shared her vocation story, is an example, the pope said. Not every path she took was the right one, but eventually she discovered God’s purpose for her life and the way she was called to serve others. Sister Marialisa said her involvement grew and she discovered a group of people who didn’t care what she looked like or what she wore, but cared about her. They helped her discover Jesus and his love. Life will be challenging and involve taking risks, the pope told the young people, but they must have the courage to change the world and to start over when they fail. “And try to find the beauty in little things,” the pope said, pointing as an example to Pompeo Barbieri, who also shared his story with the young people. The 23-year-old Barbieri recounted how, at the age of 8, firefighters pulled him from the rubble of his school in San Giuliano di Puglia after an earthquake in 2002. His teacher and all 27 of his classmates died when the school collapsed. “I wouldn’t change almost anything about my life or that tragedy except I wish my friends were still here. Just that,” he said.